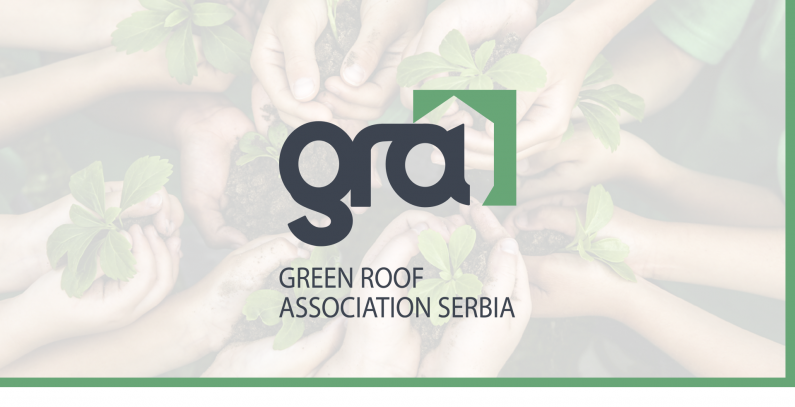 The National Green Roof Association was founded in Novi Sad in May 2018 by Erker Inženjering doo, with the aim of bringing the professional and public expertise together and proactively influencing the awareness and the need for green construction in every segment of the construction industry. A national, nonprofit, and non-governmental organization, the National Green Roof Association is a member of the European Federation of Green Roof and Wall Associations, an umbrella organization gathering national green roof associations. 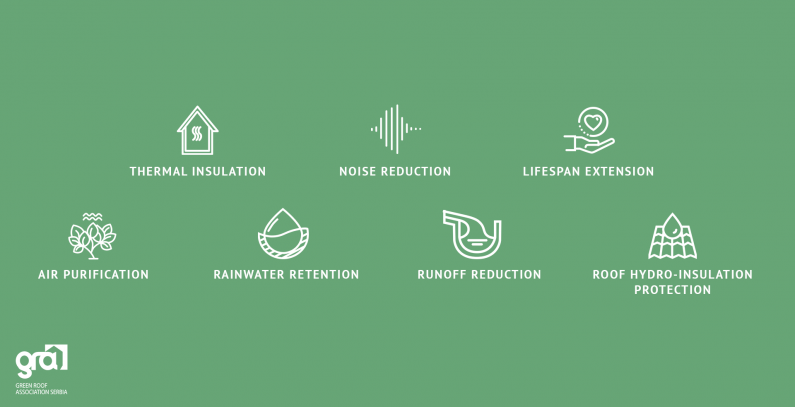 The National Green Roof Association is also a member of Connect4Climate. As a pioneer in the implementation and development of the Green Living Concept, Erker Inženjering doo has recognized, through decades of experience, the importance of association over this topic. If companies, institutions, organizations, and individuals fail to gather and use their unity and expertise to influence a systemic application of the green concept, the concept will only be applied as individual green elements such as green roofs, terraces, walls or eco-points. Encouraging changes urban planning, design, construction and restoration of facilities and the manner of their use and maintenance. Support to public-private dialogue concerning changes to laws and by-laws. Encouraging the necessary amendments to laws and by-laws as a basis for sustainable development and the practice of green construction. The green infrastructure, which has been taken to an enviable level in Europe, is the main tool along the path to urban renaissance and should be viewed as a concept equal to the transport or utility infrastructure. 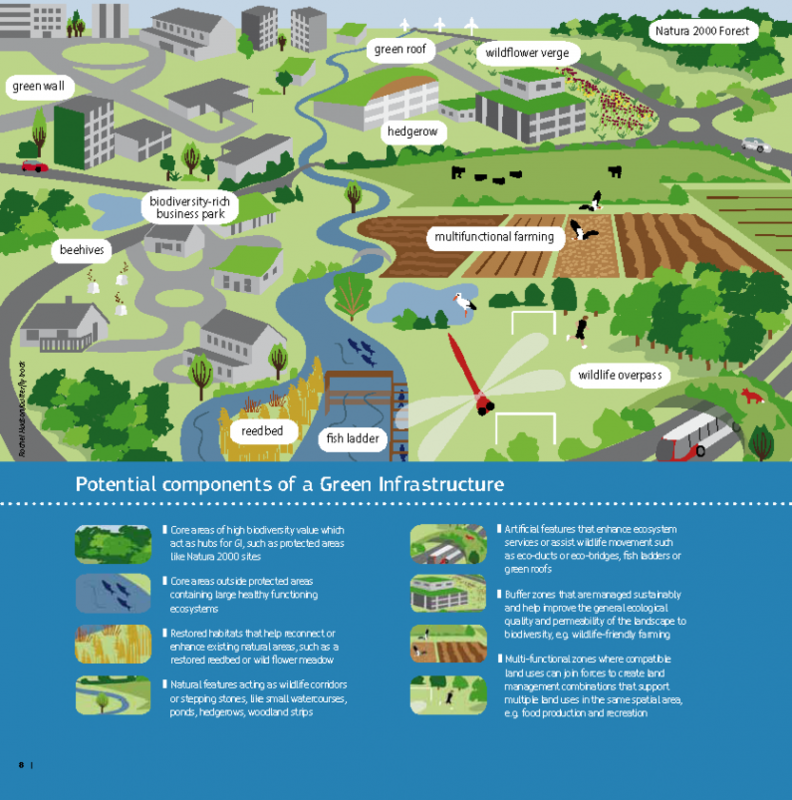 The green infrastructure refers to a strategically planned network of natural spaces designed to offer a wide range of benefits, both in rural and urban areas. Benefits that this concept brings to urban development are many and primarily refer to lowering temperature in cities (reducing the effect of the urban heat island), air quality, precipitation management, strengthening biodiversity, and the economic effect, which is being analyzed the most. Urban planning gets all the more complex if the green infrastructure is included in the process. A strategic and multidisciplinary approach to spatial planning is needed to ensure an equal implementation of the green infrastructure as roads and utility systems are designed. The green infrastructure does not involve only parks and green spaces in urban areas, which are preserved and maintained. It is also based on the development and planning of a network of linked, multi-purpose green spaces. Considered in this way, the green infrastructure contributes to the protection of habitats and biodiversity, enables response to climate change, helps secure sustainability and healthier lifestyles, improves the livability of cities and the general well-being, and provides access to recreational and other natural spaces. As such, green infrastructure supports the urban and rural economy and is part of a long-term process of green space planning. Serbia is in the position to act as a state employing a systemic approach in order to use the advantages of all the easily accessible knowledge gained so far. We have access to conducted analyses and ways in which the concept was implemented in some other European countries, and we can learn from their experiences or examples of good practice. 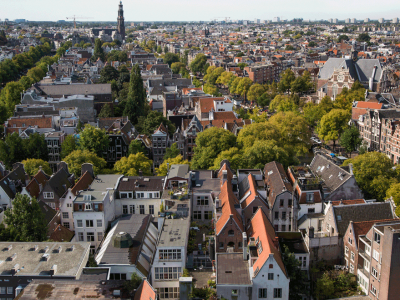 The strategic implementation of green infrastructure is taking place in many European cities independently of their size and structure. The number of examples of good practice is growing – from Linz and Vitoria-Gasteiz to Vienna, Hamburg, Copenhagen, Paris, and London, the thought-out use of the sustainable green concept is helping resolve the existing urban problems and secure a healthy future. 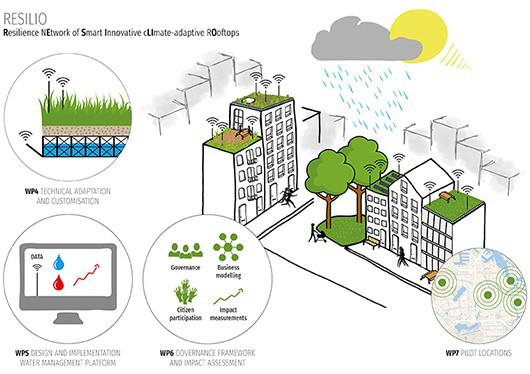 RESILIO – Resilience nEtwork of Smart Innovative cLImate-adaptive rOoftops – is an ongoing project envisaging the implementation of 10,000 square meters of green and blue roofs in Amsterdam, in four selected residential zones: van de Bellamybuurt, Geuzenveld, Oosterpark and Kattenburg. 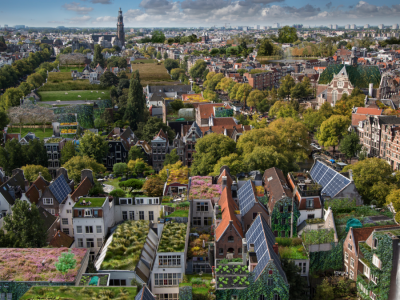 The EU’s Urban Innovative Actions (UIA) initiative has earmarked EUR 4.8 million for the project, which should be carried out in the next three years, in what is to entail a system of green and blue roofs enabling the storage of precipitation. 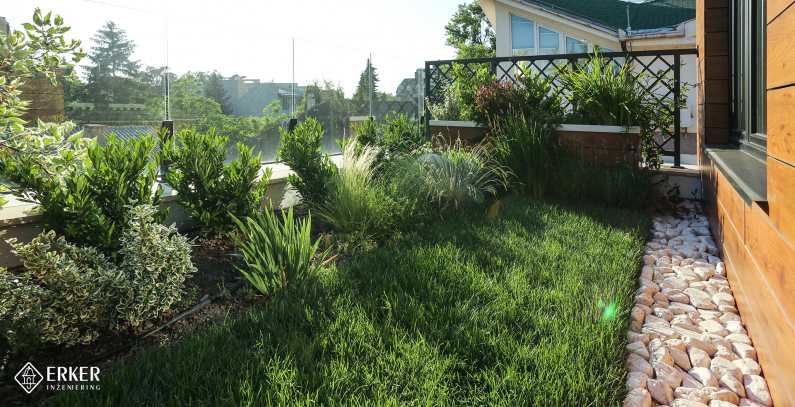 The idea is to manage precipitation, depending on weather conditions, by limiting the amount of water that goes into the sewerage system and using the retained water at times of drought as a resource to maintain greenery on roofs. Representatives of companies, educational institutions, and non-governmental and state organizations. Representatives of leading companies, non-governmental and state organizations making a significant contribution in the area of green building and smart cities. Independent journalists, freelance creatives, researchers and nature lovers. More information about the work and activities of the National Green Roof Association can be found at www.nazk.rs.